I recently purchased my first boat! A Neptune 24 by Capital Yachts, called Bon Temps (good times). I have MANY upcoming projects in line to restore this boat, which is around the same age as me. I just mounted a Go Power GPSW-300 inverter, but have no clue where the chassis ground wire is supposed to go?? The instructions from Go Power clearly indicate that I need to use 8 AWG wire, but don't specify what to connect this to. Many posts in the forum say to ground an inverter to the engine block, but I'm under the assumption they are referring to a larger inboard motor, and not a tiny outboard like I have. So, I think I answered my own question after some more extensive online research. One of the preferred methods for grounding both DC and AC is with a dedicated ground plate. However, this approach is expensive, and currently beyond my skill level. I think I'll just leave the inverter ungrounded for the time-being. Ryan, I happen to have the instruction manual here. My reading of the instructions is if the AC out put of the inverter is not connected to another panel, such as the AC panel in the boat, then it is not necessary to ground the chassis. However, if it is connected to an AC panel there are some issues to address because of the multiple grounding sources. A couple of questions, what do you plan to power with the inverter? How large is your battery bank? How are you charging the batteries? Hey, Dave. Thanks for responding. No. I do not intend to connect the inverter AC out to the boat's AC panel. I got the inverter to run low amp AC devices when I go camping, so I don't have to run my generator 24/7. I have a Honda EU2000i that I use for any big loads, such as the AC and heater, and for recharging my battery at night. The devices that I'll most often run are a laptop, tablet, and cell phones. I currently have a single 100Ah marine battery. When this battery's life runs out I'll replace it with either 2 - 100Ah AGMs, or 3 - 80Ah AGMs. Ryan, have your been over to MarineHowTo.com? There is a wealth of information on batteries, charging, and electrical systems on the site, among other topics. A few thoughts on your proposed plan. Small electronics that can be charged via a USB port are better charged directly from a 12v source rather than through an inverter. Converting 12v DC to 120v AC and back to 5 v DC introduces a lot of power loss. Adding a dedicated USB outlet or a 12v "cigarette lighter" outlet with a USB charger is a better alternative. AGM batteries have 2 advantages, they can accept a high rate of charging and can be discharged a little more deeply than a typical FLA battery. On the downside, they are not very robust, if they are not charged quickly and fully when they are discharged, they die quickly. Leaving them in a partial state of charge is deadly. FLA batteries are much more robust and tolerant of abuse. Also consider 2 6v GC batteries. These are true deep cycle batteries and are designed to be deeply discharged on a regular basis. There is plenty of info on MarineHowTo.com this topic. Now about that generator. In a campground surrounded by trees and other vegetation, the noise may not be all that noticeable. However, in a nice quiet anchorage, the sound, even from a Honda will travel a considerable distance over water. Running a generator in a quiet anchorage will not endear you to the other sailors in the anchorage, especially if the generator is run for a long time in the evening or at night. The catch is if you invest in AGMs and want them to last, you'll need to charge them for a longer time than most will want to listen to your generator. So you may want to consider alternatives, such as solar power and GC batteries. I just mounted a Go Power GPSW-300 inverter, but have no clue where the chassis ground wire is supposed to go?? 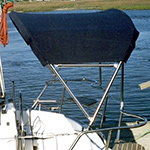 On a boat without a vessel ground the inverter chassis ground would go to battery negative. Make 100% sure that your inverter is fused within 7" of the house banks + terminal too. That said, I agree with the others that you are far better off to stay DC for charging/powering your "laptop, tablet, and cell phones" as it will be more efficient and you don't have a lot of battery bank to begin with. Also remember that on top of the conversion and inverter inefficiency hits there is also the standby quiescient draw of the inverter to consider as well. Small inverters like that can burn .2A to .5A just sitting there idling waiting for a load to turn on. Ryan, have your been over to MarineHowTo.com? Small electronics that can be charged via a USB port are better charged directly from a 12v source rather than through an inverter. Good call! I'll charge any battery-powered device on board from the 12V DC cigarette lighter plug. However, this now completely negates the original purpose I had for purchasing the inverter... I suppose I'll keep it on board for any AC-only device we may have on board at the time. In a campground surrounded by trees and other vegetation, the noise may not be all that noticeable. However, in a nice quiet anchorage, the sound, even from a Honda will travel a considerable distance over water. Running a generator in a quiet anchorage will not endear you to the other sailors in the anchorage, especially if the generator is run for a long time in the evening or at night. The catch is if you invest in AGMs and want them to last, you'll need to charge them for a longer time than most will want to listen to your generator. So you may want to consider alternatives, such as solar power and GC batteries. Coming from an RV camping background, I think I may have under-estimated the annoyance of a generator on a boat. However, most of my boat camping locations are remote, with nobody within miles of me, so I tend to be the only one annoyed by the sound. I plan to fuse the inverter within 7" of the battery bank with a Safety Fuse Block and Heat Shrink Ring Terminals. Thanks for the reminder on that one. I'm aware of the standby current draw on the inverter. My simple solution to that is to manually switch between ON/OFF when needed, and never put the inverter into STANDBY mode.